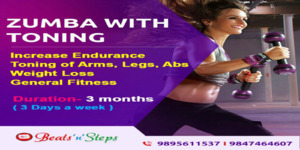 BeatsnSteps, a dance fitness studio is offering Zumba Fitness regular and toning programs on all days of the week in South Kalamassery and Panampilly Nagar. The classes are handled by trained, certified instructors and enable participants to manage weight, shed obesity, fatigue and weakness. It helps maintain skin texture, heart rate, appetite and blood circulation. Keep looking young and healthy.